Join UNPO and our partners on 18 September 2018 for the 'RESIST XI' protest on the occasion of the 73rd United Nations General Assembly. Under Xi Jinping’s increasingly totalitarian rule, crackdowns have intensified against voices demanding freedom, democracy, and human rights across China and its occupied territories. Despite the repression, resistance against Xi's brutal anti-democratic tactics continues to grow. Stand with Tibetans, Uyghurs, Southern Mongolian, Taiwanese, Hong Kongers and Chinese against Xi's Totalitarian rule. 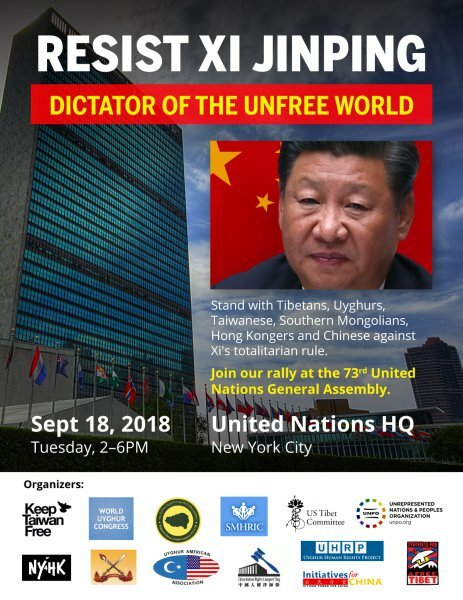 Join us to send a clear message to the international community that Xi Jinping is not the savior of the free world, but a dictator of the unfree world.